We all appreciate an app with single-sign on. Whether you're in a hurry, don't want to remember another set of credentials, or just like having your apps integrated, the idea of a one-click registration and a one-click log-in is very convenient. So why don't more apps have it? Development: the time and effort required to build, and then maintain, a secure implementation that also integrates with social logins or enterprise identity providers is a pain. For most companies, it's a pain that doesn't match up with the potential benefits. It's just a “nice-to-have” feature. Design: to some designers, SSO is actively undesirable. With social buttons all over your sign-in page, their thinking goes, you'll just end up confusing your users and muddling your messaging. Plus, it doesn't square with the idea of simplicity and reducing decisions people have to make. At Auth0, we couldn't agree more about the importance of quick, technical debt-free development. That's why our SSO app requires only one click to implement, and only a few more to configure for any of the major enterprise identity providers or dozens of social media logins you might want to add. And of course the user journey matters—but the log-in page is a place that does not obey all the traditional rules of design. When you introduce SSO, you don't introduce complexity or confuse people. You make it easier to get started. The truth is that single sign-on is one of the easiest ways you can cut friction out of your user journey, improve your app's stickiness, and in the process lift your retention numbers and conversion rates. Here's why. When it comes to getting and keeping users, nothing is more important than speed. That might sound crazy, but the login screen—the first thing we see in most apps—is extremely important for setting the tone for the user experience. Within milliseconds, users are going to make a decision about whether they want to go forward. Here's an app with and without social SSO—which are you most likely to try? If you're on a phone, the answer is obvious: the one where there's no typing involved. No one likes painstakingly writing out their whole email address and a new password on an on-screen keyboard. When you click “Sign Up,” you then have to wait for a confirmation email, click into that, tap the link to confirm your account, tap Confirm to go forward—the whole process is laborious. A lone email prompt on sign up creates decision fatigue: we're simply too overwhelmed by the choices in front of us to make a rational decision. Do we really want to remember a whole new set of credentials? Do we trust that this app is keeping our data safe? Make people think too much about this kind of stuff, and your app will suffer. Social proof reduces friction. Facebook and Google are companies that you trust to keep your information safe, and that makes sense: they have a lot more at stake than your average App Store developer. Apps that use SSO and incorporate social login get a boost of social proof simply by allowing you to use these services to sign up with a single button press. That last one may sound small, but 3-4% of what may well be hundreds of millions of dollars MRR is a huge chunk of change. The key thing to keep in mind is that a download is not a conversion. But if you can make it as easy as humanly possible for users to get started, you can up your odds of making a conversion by a significant margin. Early return rates are especially critical to growth. According to a Localytics study, the average app loses almost 80% of its users within three days. What's even more interesting is that the churn rate, or the rate at which you lose users, is about the same no matter how “good” your app is. Here's the rate of lost users by where apps placed in the Google Play app store. The key takeaway here is that you basically have three days to convince your users to stay around. If you can keep 80% of your users around on Day 1, then you're on track to have yourself a Top 10 app. If you don't have 40% around after Day 1, then you're not going to crack the top 100. 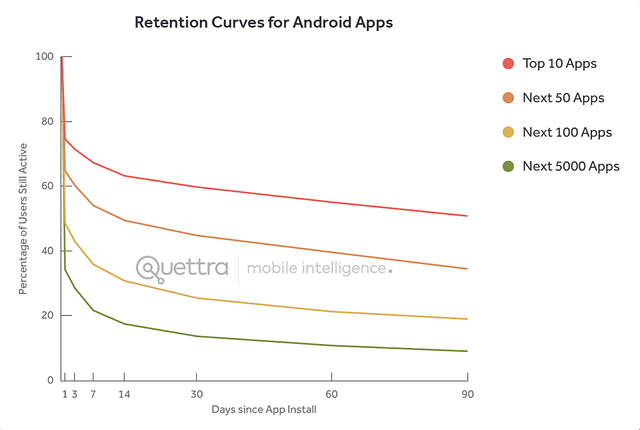 The effects of a good first activation will bend your retention curve from the start, but you still need to make an effort to bring people back to your app on the second day, and the third, and so on. 30% of users come back to apps on a monthly basis, according to Fred Wilson of Union Square Ventures. 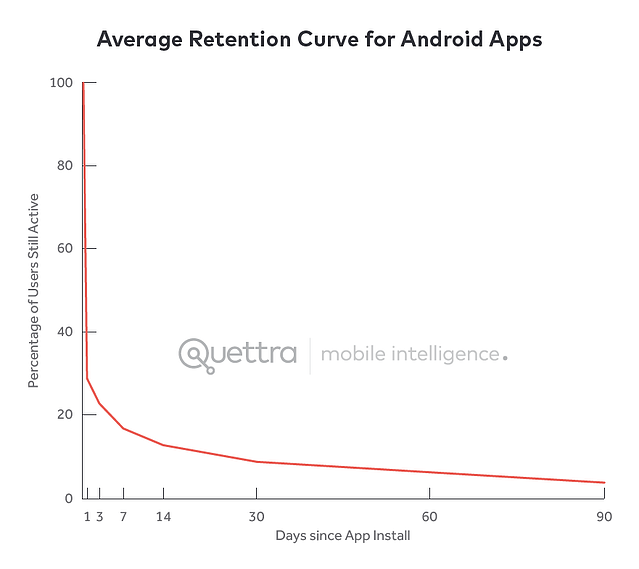 10% of a given app's users come back every day. 92% of users have reported that they've simply ditched an app for which they forgot their unique username/password information, and a third said they do so frequently. While your daily users probably aren't going to forget their log-in information, a whole third of your user base isn't at daily usage yet. When they do forget their info, there's a high probability that you'll never see them again. 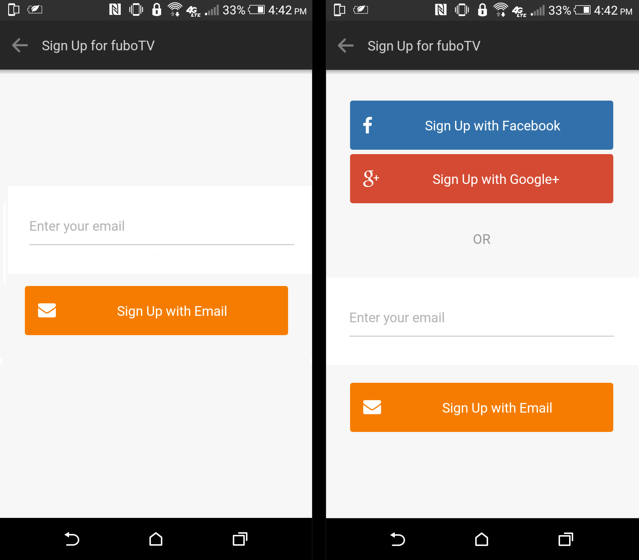 With SSO, inactive users can come back to your app and they won't even have to log in. It's like you left the porch light on for them: it's simple, it's feel-good, and it keeps them in the fold. If you're trying to get information about people without a social login, then you're facing another big problem that you probably don't want to think about: fake data. 80% of people have reported that when they're forced to invent new profiles just to get access to a new product or service, they leave information incomplete or actively make stuff up. You've probably done it too. No one likes tedium, and typing in “asdasdas” for the state or country you live in is a lot easier than trying to navigate an unresponsive drop-down menu. From then on, it's usually “asdadas” all the way down to asdadas@gmail.com. 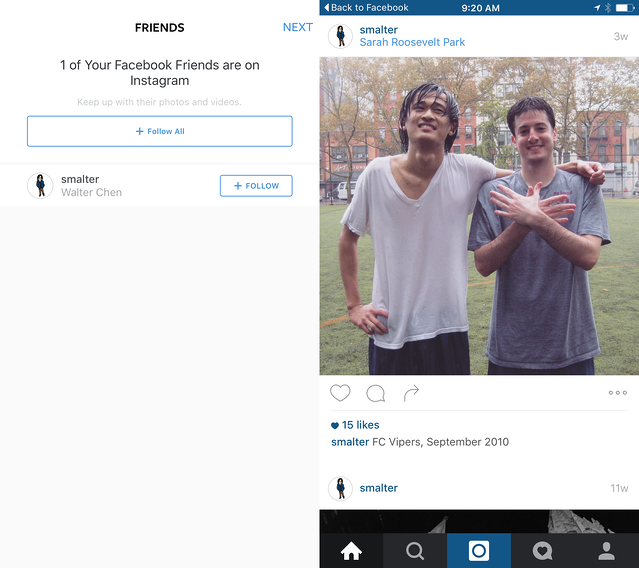 Fake data doesn't just represent a missed opportunity to personalize your app's experience. It actively skews your analytics and slows your team down. Instead of having to clean your database up all the time, implement SSO and request the information you want directly from your users. Here's the key. When you're upfront, people are responsive. When you put them through a whole rigmarole of data collection, you lose them. SSO isn't just about security or seamless integration. It's also a powerful tool for designers, marketers, growth hackers and developers to use to improve the user experience and create a stickier product. Whether you're optimizing for the first milliseconds of the user journey or connecting new users to their friends on the platform, having a one-click SSO solution is essential. And it's easy to implement, too.